Henryetta senior Kobe Johnson is an Oklahoma Academic All-Stater. The son of Darin and Amie Johnson, he is among the 100 Oklahoma seniors receiving the honor this week. The Oklahoma Foundation for Excellence made the selection from 536 nominations out of 82 schools. To be nominated, students must meet one of the following criteria: an American College Test (ACT) composite score of at least 30; a combined SAT evidence-based reading and writing and math score of at least 1340; or be selected as a semi-finalist for a National Merit, National Achievement or National Hispanic Scholarship. This year’s All-Staters scored an average of 33.4 on the ACT, with eight recipients scoring a perfect 36. The students’ average GPA was 4.24. In addition, 30 of this year’s All-Staters are National Merit semifinalists, and three are National Hispanic Scholars. Academic All-Staters are nominated by their principals or superintendents and are selected on the basis of academic achievement, extracurricular activities and community involvement, as well as an essay submitted by each nominee. Each of this year’s winners will receive a $1,000 merit-based scholarship and a medallion. Johnson has been a member of the HHS Knights football team as well as the track team, student council and academic team and Knights for Christ for four years. He is also a member of the National Honor Society and on the power lifting team. 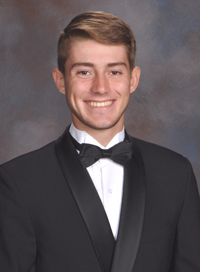 Following graduation, he plans to attend the University of Oklahoma to major in biochemistry before pursuing a career in pediatric oncology. Okmulgee's Natalie Berryman was the only other county student named as an Academic All-State member.